266 pages | 11 B/W Illus. 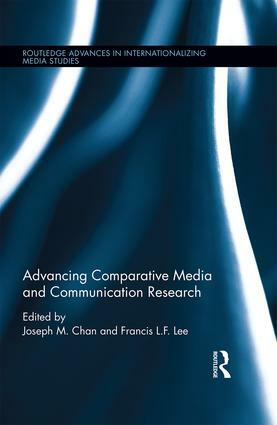 A comparative approach to media and communication research plays an important, if not indispensable, role in achieving a core mission of researchers: to delimit the generality and specificity of media and communication theories, enabling researchers to more readily identify the influence of social, political and cultural contexts in shaping media and communication phenomena. To de-Westernize and internationalize media and communication studies has thus become the way forward for overcoming the parochialism of mainstream media and communication studies. This volume reflects on what comparative media and communication research has achieved or failed to achieve, the epistemological and theoretical challenges it is facing, and the new directions in which it should be heading. 2. Can We Compare Media Systems? Joseph M. Chan is Research and Emeritus Professor in the School of Journalism and Communication at the Chinese University of Hong Kong. Francis L.F. Lee is Professor in the School of Journalism and Communication at the Chinese University of Hong Kong. Through publishing comparative and region-specific studies, this series aims to bring Asian, Latin American, African, and Middle Eastern media and cultural studies scholarship to the English speaking world and--in addition-- to promote cutting edge research on the globalization of media, culture, and communication.